With contemporary sports styling, lightweight design, and cushioned soles, Sportmates steel capped joggers are perfect for workers on the go. Best of all, comfort, this breathtaking design comes at pricing that won't leave you gasping. Upper material / colour: Suede - Black – Cordura – All Black. Outer sole : Rubber - Black / grey - grey shank part. Eva mid sole : light grey as sample. 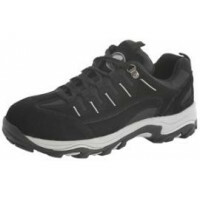 Jual Sepatu Safety Bata Kepler Bata Sportmates KeplerSportMates® are the latest in sports styled ..